Action-adventure books for the mystery lover. In this series, modern-day archaeologist and adventurer Matthew Connor travels the globe with his two closest friends to unearth treasure and discover legends the world has all but forgotten. Indiana Jones meets the twenty-first century. Not only is the evidence questionable but it means looking for the lost city of Paititi far away from where other explorers have concentrated their efforts. As appealing as making the discovery would be, it’s just too risky. But when Cal’s girlfriend, Sophie, is abducted by Matthew’s old nemesis who is dead-set on acquiring the Pandu statue, Matthew may be forced into action. Saving Sophie’s life means either breaking into the Royal Ontario Museum to steal the relic or offering up something no one in his or her right mind can refuse–the City of Gold. 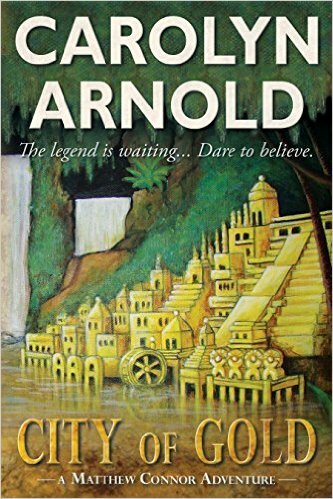 When Matthew’s friend Cal’s girlfriend is abducted, he, Cal, and their friend Robyn are forced to undertake a quest to find the lost city of gold to pay her ransom. Not everyone is what they seem, and there are much worse things in the jungle than the men the kidnapper has sent along to keep an eye on Matthew’s party. City of Gold is a fast-paced action adventure story that feels something like Friends-meets-Romancing the Stone. This was a quick, entertaining read – I devoured it in one sitting! Keep reading below for an excerpt. Carolyn was born in a small town, but that doesn’t keep her from dreaming big. And on par with her large dreams is her overactive imagination that conjures up killers and cases to solve. She currently lives in a city near Toronto with her husband and two beagles, Max and Chelsea. She is also a member of Crime Writers of Canada. THE SOUND OF HIS THUMPING heartbeat was only dulled by the screeching monkeys that were performing aerial acrobatics in the tree canopy overhead. Their rhythmic swinging from one vine to the next urged his steps forward but not with the same convincing nature as did the bullets whizzing by his head. Matthew glanced behind at his friends and was nearly met with a bullet between the eyes. He crouched low, an arm instinctively shooting up as if he’d drop faster with it atop his head. The round of shots hit a nearby tree, and splintering bark rained down on him. “Hurry!” he called out, as he peered at his companions. “What do you think we’re—” Cal lost his footing, tripping over an extended root, his arms flailing as he tried to regain his balance. Robyn, who was a few steps ahead of Cal, held out a hand, her pace slowing as she helped steady him. “Pick it up, Garcia!” Matthew didn’t miss her glare before he turned back around. He hurdled through the rainforest, leaping over some branches while dipping under others, parting dangling vines as he went, as if they were beaded curtains. His lungs burned, and his muscles were on fire. One quick glance up, and the monkeys spurred him on again. Not that he needed more than the cries of the men who were chasing him. The voices were getting louder, too—growing closer. Several reports sounded. Another burst of ammunition splayed around them. “If we get out of this alive, you owe me a drink.” Her smile oddly contrasted their situation. “I’ll buy you each two,” Matthew promised. Cal ran, holding the GPS out in front of him, his arm swaying up and down, and Matthew wasn’t sure how he read it with the motion. “Where do you expect to take us, Cal? We’re in the middle of a damn jungle,” Robyn said. “Round here. Go right,” Cal shouted. Another deafening shot rang out and came close to hitting Matthew. “You don’t have to tell me twice.” Matthew ramped up his speed, self-preservation at the top of his list while the idol secured in his backpack slipped down in priority. Most of their pursuers were yelling in Hindi, but one voice came through in English. He was clearly the one giving directions, and from his accent, Matthew guessed he was American, possibly from one of the northern states. “I have to stop…and…breathe.” Robyn held a hand to her chest. “We stop and we’re dead. Keep moving.” Cal reached for her arm and yanked. “What?” Cal lowered the arm that was holding the GPS. Matthew laughed but stopped abruptly, his body following suit and coming to a quick halt. He was teetering on the edge of a cliff that was several stories high, looking straight down into a violent pool of rushing water. He lifted his gaze to an upstream waterfall that fed into the basin. Cal caught Matthew’s backpack just in time and pulled him back to solid ground. The rush of adrenaline made Matthew dizzy. He bent over, braced his hands on his knees, and tucked his head between his legs. He’d just come way too close to never reaching his twenty-ninth birthday. “Sure, blame the black guy,” Cal said. More bullets fired over the empty space of the gorge. “What do we do now?” Cal asked. Matthew forced himself to straighten to a stand. He hadn’t brought them all the way here to die. He’d come to retrieve a priceless artifact, and by all means, it was going to get back to Canada. He pulled off his sack, quickly assessed the condition of the zippers, and shrugged it back on. He tightened the straps, looking quickly at Cal and then at Robyn. One stood to each side of him. He had to act before he lost the courage. He put his arms out behind them. Matthew wasn’t a religious man, but he was praying for them on the way down. I’m pleased to welcome Amy Metz to the blog today. 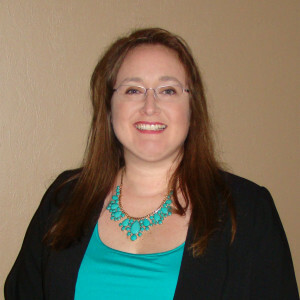 Amy is author of the well-reviewed Goosepimple Junction Cozy Mystery series, and was kind enough to take the time to answer a few questions so we can get to know her. Cozy fans – be sure to check the links at the end of the interview, and keep an eye out for a new book coming this Spring! 2. It wasn’t like he never visited the artifacts he’d tracked down. He just preferred not to see them on their opening nights. 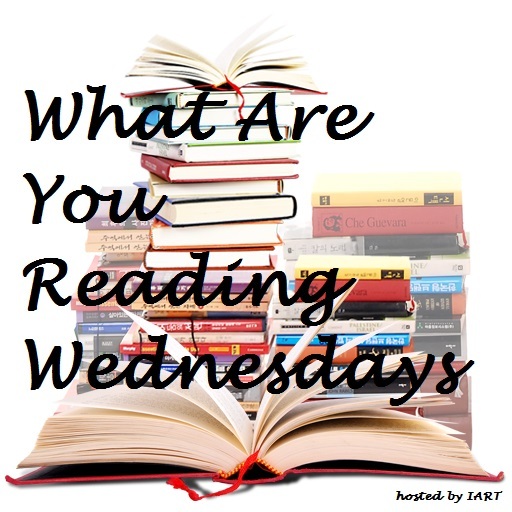 So what is everyone else reading this Wednesday? Be sure to visit the blog tour page for a chance to win your own copy in the Rafflecopter giveaway! Fans of Joyce and Jim Lavene will thrill at this collection of thirteen short stories—many are set in the worlds of their national bestselling mystery series, including the Missing Pieces Mysteries, the Renaissance Faire Mysteries, the Retired Witches Mysteries, and an upcoming mystery novel! These stories contain the elements of mystery and fantasy the Lavenes are famous for, as well as some new things their readers have never seen. Several stories feature characters interacting with ghosts, magic, and the supernatural—the healing woman in “Courtship;” the Civil War widow in “One with the Darkness;” the city girl who summons a wizard from the past in “The Magician and the Sorceress/Accountant;” and the young introvert in “Aunt Edna” who finds her calling with help from a ghostly visitor. Poignant, charming, and captivating, Joyce and Jim Lavene bring their characteristic wit and heart to these stories and introduce each one with a passage about its origin or how it ties into the universe they’ve created. Gone by Midnight is a treasury of tales that will delight the mind and touch the heart from one of the most prolific writing duos of our time. 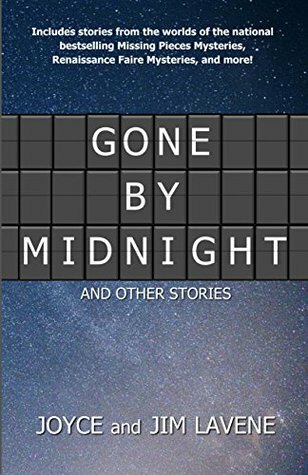 Gone by Midnight is an entertaining and eclectic collection of stories. From the opening sweet ghost story “Aunt Edna”, to sci-fi, fantasy, and everything in between, I enjoyed them all. My favorites were the fantasy tale within a tale, “Inn of Many Pleasures “, and the futuristic “Assasin!”. NOTE: I received a free digital copy in exchange fr an honest review. Hi everyone. Please welcome Melissa Lynn, author of Between the Two of You, to The Book’s the Thing. Melissa will be sharing some indie author recommendations today. Have a look, and be sure to stop by Amazon or Melissa’s website to check out her new book!